I see you sitting there, just waiting for a conversation. With me. There are many things I cannot eat. Doughnuts. Pizza. Sandwiches. Scones. Crumpets. Eclaires. My journey into Celiac territory has always been interesting. Not only do I get to enjoy foods that are naturally gluten free, such as steak, sushi, ice cream and wine, but I also get to explore new ways of cooking in order to still enjoy recipes that traditionally use flour. I’m lookin’ at you, gravy. However, I have always enjoyed beer. Whaaattt….beer?? But…beer is made from wheat, rye and barley?! You can’t drink beer. What if I told you I have never had even the smallest reaction to beer. Ever. Because beer is gluten free. Here’s the deal: there is science to back this up. I am going to be quoting many places which have the results of what the question is, what it means, how it compares to other products…and then we can all continue to enjoy Irish Death in peaceful harmony. 1) What is gluten, and why do beer companies claim their products are gluten free, if they are using rye, wheat and barley? Celiac.com: “There have been numerous claims that traditional barley-based beers are gluten free or that all beers are gluten free. Unfortunately, the area is very grey and substantiated on technicalities. 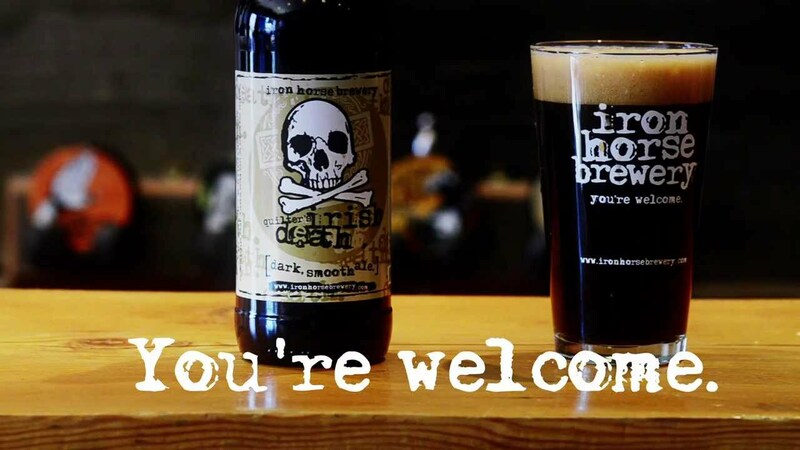 The purpose of this post is to eliminate the confusion about gluten as it relates to beer. Gluten is an umbrella term used to describe a mixture of individual proteins found in many grains. Celiac disease (celiac sprue or gluten intolerance, gluten sensitivity) is an autoimmune disorder that is triggered by the ingestion of some of these glutens. People with classic celiac disease are intolerant to the gluten proteins found in wheat, barley, rye, spelt and a couple other lesser known grains. All these grains have a relative of the gluten protein. Interestingly, corn, rice and sorghum also have gluten proteins but are not toxic to celiacs. Herein lies one of the fundamental problems; the use of the term gluten intolerance to cover only certain gluten containing grains is confusing for consumers and food manufacturers alike. Unfortunately, it seems that the inertia for using celiac disease and gluten intolerance as synonyms is unstoppable. Therefore, it becomes the responsibility of both consumers and manufacturers to make sure the terms being discussed are defined and understood. As this relates to beer, there is a gluten protein found in barley. This protein is known as hordein. Wheat gluten is known as gliadin. Rye gluten is known as secalin. Presently, assay tests (or lab tests) are only commercially available for the testing of gliadin. We are unaware of any tests for hordein or any manufacturer that presently tests for hordein (Note: If you know of anyone that does in fact test specifically for hordein, please let us know). Therefore the idea that a barley based beer can be considered gluten free based upon the lack of testing is very difficult to fathom. It should be understood that a company using an assay test for gliadin to test for hordein will not return accurate results. There has been widespread speculation that the brewing process eliminates these hordein proteins making all beers gluten-free. Although commercial assay tests for hordein are not available there is conclusive evidence that the brewing process does not degrade hordein to non-toxic levels. A research study in Australia on improving beer haze shows that hordein is still present in beer after the brewing process (http://www.regional.org.au/au/abts/1999/sheehan.htm). Therefore, claims that hordein or gluten is destroyed in the brewing process is unsubstantiated and clearly, based upon the Australian research, is highly questionable. 2) So, why can people with Celiac have 20ppm of gluten, if gluten is technically a toxic entity in their bodies? So, we can have up to 20ppm of gluten in one serving of food before there are any adverse affects to our bodies. 3) How much is 20ppm, for those of us who are not science-inclined? Gluten Free Dietician: “To break it down, 20 parts per million is the equivalent to 20ppm per kilogram of food. An average slice of gluten-free bread containing 20ppm of gluten (which is all of them- link to results) would contain 0.57 milligrams of gluten. Even if you ate ten ounces of foods containing 20ppm gluten, that would be just 5.70 mg of gluten. This level is just over half of the 10mg found by Catassi’s study to be a safe level so you would need to eat a whole lot of 20ppm food each day to surpass the “safe” level. My tolerance to gluten is definitely going down, the older I get and the longer I have been on a gluten free diet. My tolerance level, at this point, is at about 40ppm until I start feeling anything, so it is roughly the equivalent of 32 slices of Udi’s bread. But I figure I’ll be having a lot more problems than gluten reactions, if I go that route. 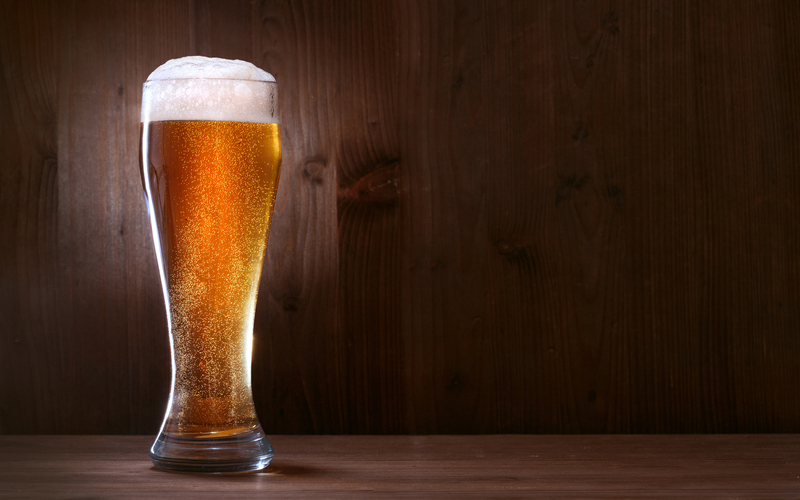 4) So, how much gluten is in beer? 10-15ppm of gluten is 0.01mg of gluten. A 1oz slice of white bread contains about 3.5g of gluten. 10-15ppm of gluten is equal to half of 1/100th of a piece of bread. 5) Finally, just be careful. No matter what science says. Beer has the same amount of gluten, if not less, as the average gluten free product. Which is why beer is gluten free, in the same manner that Udi’s Gluten Free Bread is gluten free. it is so I can drink beer. Hey, anyone else stupidly excited about Jurrasic World? Because I am stupidly excited about Jurrasic World. I’m taking a couple of the older kids to the movies this afternoon, and I am going to dream about dinosaurs all night. SO, with that being said: today is a great pizza day! The best thing about this recipe: it actually tastes like pizza. It isn’t made out of cauliflower, quinoa, tofu, asparagus or unicorns. 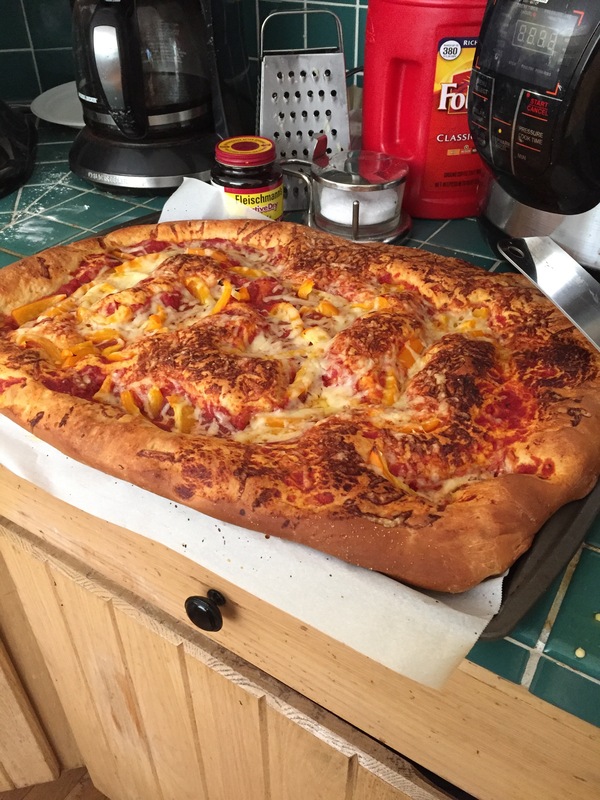 It is a straight up, solid, easy pizza recipe. 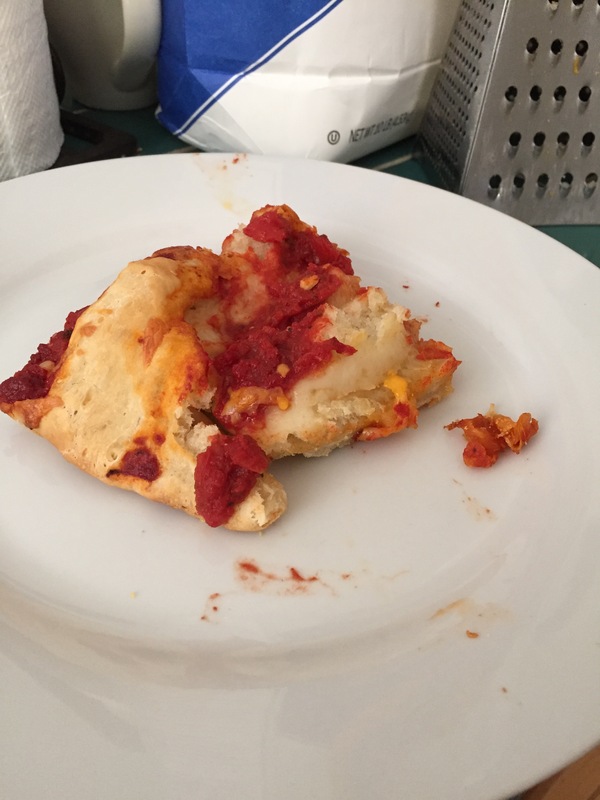 Okay, so I have been making this pizza all week for lunch, because it is amazingly easy…and the kids go nuts over it. There are no leftovers with this pizza. These are reviews us mothers live for. 😉 Seriously, after a few days of sandwiches at home, you have to start thinking outside the box for meals. And since we eat at home every day, I run out of interesting ideas unless I spend a good hour in front of a notebook once a week brainstorming meal planning. So here you go! An easy pizza recipe anyone can make! Add the yeast, warm water and sugar to a mixing bowl. Let sit and froth for 5 minutes. Add flour, salt, and oil and mix until smooth. You may need to add a little more water, but add it ta tablespoon at a time. Pour the dough onto parchment paper on a baking sheet, smooth out to all corners and put the sheet into the oven to rise for 30 minutes. Let cool before you start cutting it…and then enjoy thoroughly!! 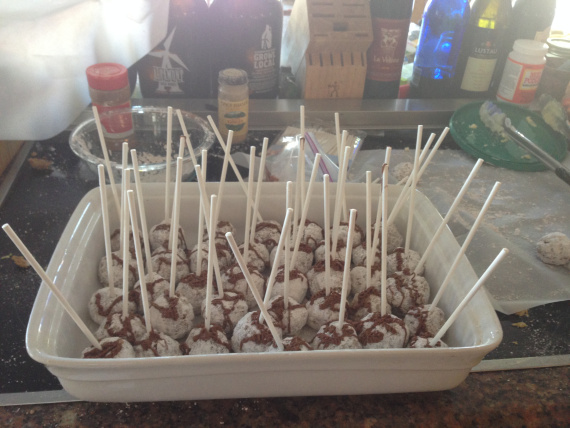 When you think of “Gluten Free BBQ Potlucks,” you may not be filled with spectacular joy. You may think of cardboard hamburgers. 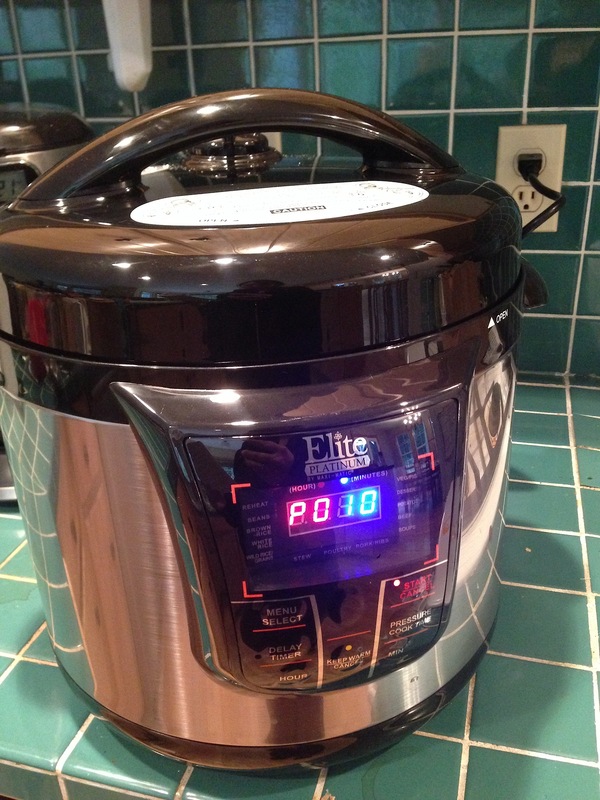 You may think of translucent quinoa crockpot stews. You may even think that “gluten free” is just the open doorway to kale salads. 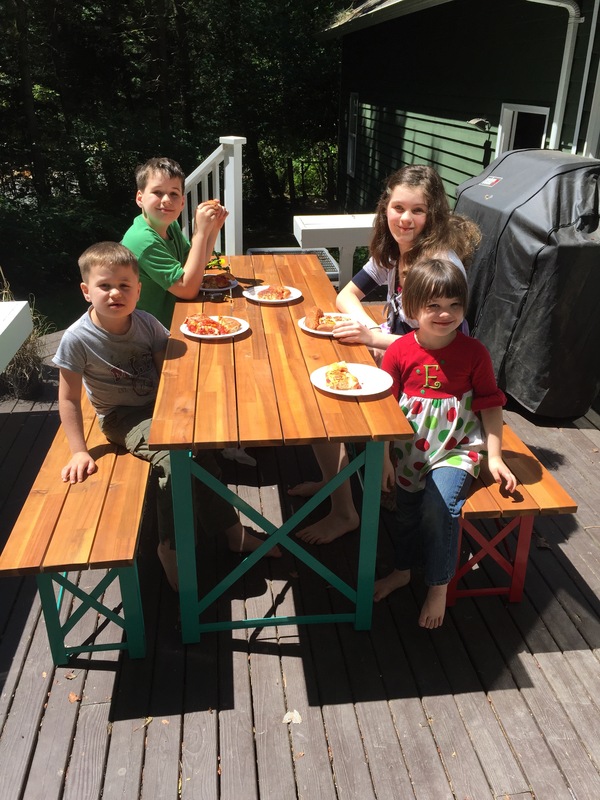 Everyone has their own culinary fears surface when they think of gluten free BBQs. But it can be great! Trust me: I am not a fan of bad food. 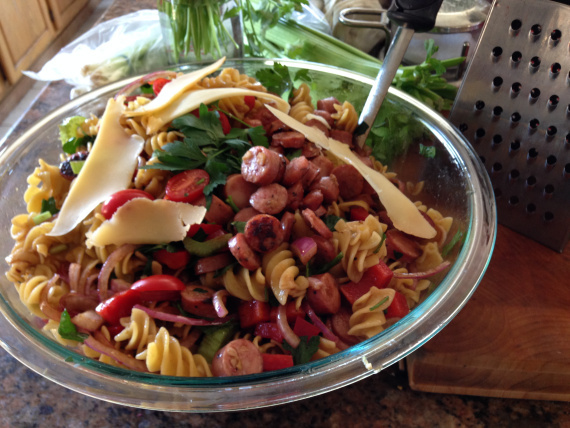 I like good food, and I refuse to give in to bland, questionable dishes at BBQs. BBQs should be filled with culinary solidarity! We should enjoy the meal, just as we enjoy the fellowship! I have the pleasure of having Celiac, which I can unequivocally say has improved my quality of life. Which is a weird thing to state, I understand. I don’t really miss any of these. Okay, I actually do really miss flour tortillas. There is nothing like biting into the soft flour tortilla for a burrito. I have tried gluten free tortillas, and they are all unconditionally terrible. But the rest of the items I am forbidden to eat…I probably shouldn’t be eating anyway. Before I discovered I had Celiac, I just ate whatever I desired. Since discovering this autoimmune blessing (yes, blessing), I have had to actually do research on what food I am not only putting into my body, but into my family’s as well. I have taught myself how to cook nutritious food from scratch that actually tastes amazing (these two do not always go hand in hand). So, in the end, I my quality of life, and my quality of cooking, is significantly better because I have Celiac. 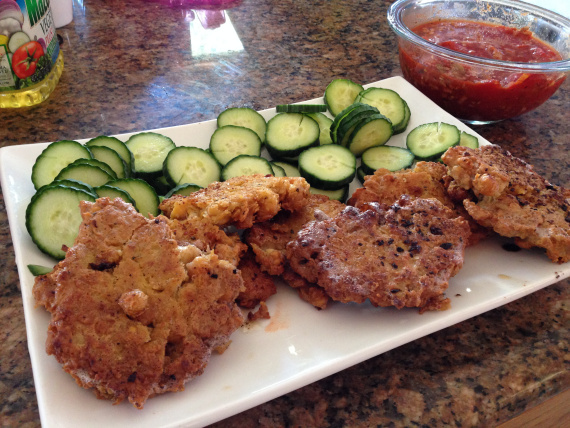 Enjoy these gluten free BBQ recipes links this Memorial Day. So, in the end, I my quality of life is significantly better because I have Celiac. I cannot trust anything that has been pre-made. Anything. Even gluten free items. Even certified gluten free items. I had to stop eating gluten free pasta, because I would have violent reactions (lack of breathing, flush cheeks, muscle spasms, etc) after eating gluten free pasta. 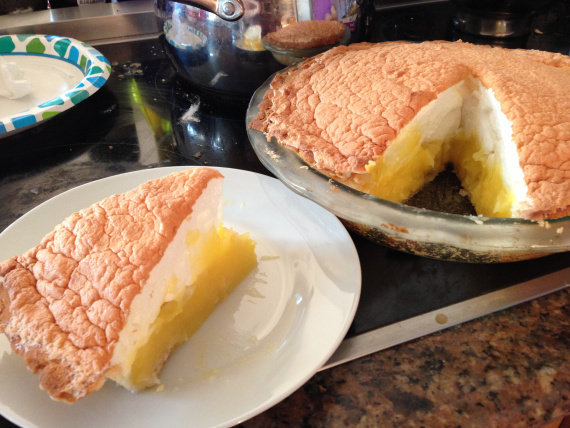 Why is this…it is gluten free! Maybe the labeling says gluten free, but legally a company can include up to 0.025% gluten in their food, and still be considered gluten free. That 0.025% makes a difference when my body sees that as eating 0.025% poison I am putting in my body. Lately I have had to stop eating the gluten free pizza in the Costco freezer section. And last night I was in bed with another violent reaction to Udi’s Gluten Free Bread, which I never thought was a problem before. It is incredibly frustrating, since this was a safe option for me; but after a few tests over the course of a few weeks, you at some point you have to admit there is a problem. You aren’t just tired, you aren’t just imagining things. Laying in bed with muscle cramps and not being able to breathe, and then feeling fine 2-3 hours later, is a big indicator that there is something wrong. That is Celiac, my friends. 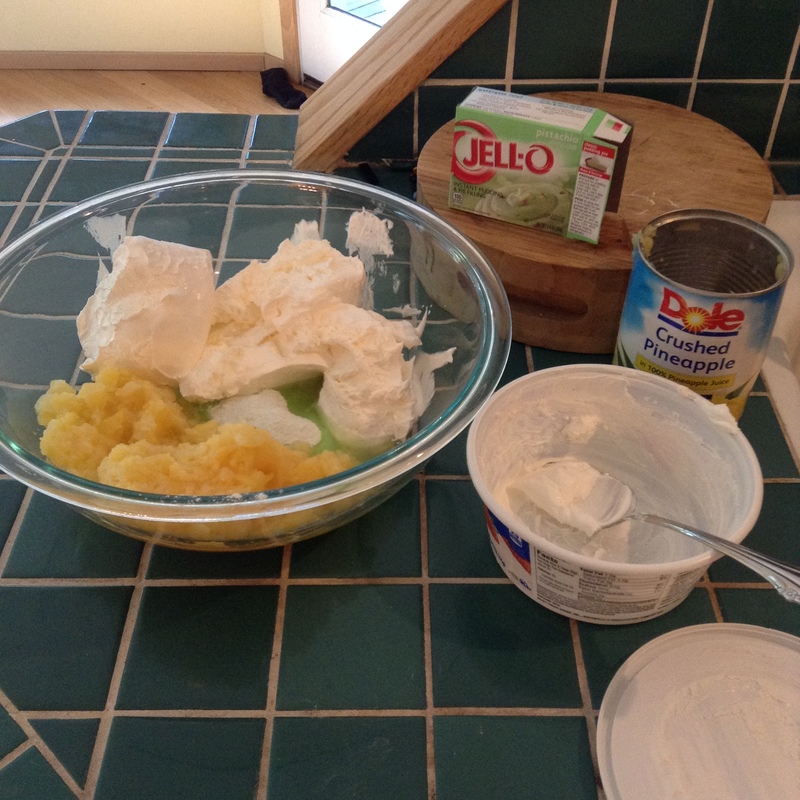 Jello, Cool Whip and Pineapples. I grew up with Pistachio Salad as a staple in my life, and it didn’t occur to me until the other day that I have actually never made this for my family. Maybe it is a little too 1950s, maybe it’s that it’s green…who knows. One way or other, this never made it to my kitchen. 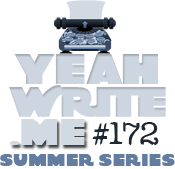 I wish I could make this sound like a really impressive and complicated recipe to woo you into thinking I am some Jello mastermind, able to turn weird Jello flavors into ravishing desserts that Wolfgang Puck will pay good money to discover…but it’s just not going to happen with this one. Three ingredients. Throw them into a bowl. Enjoy thoroughly. The only thing I can think to make this more interesting is trying to figure out which cocktail goes with it best. Probably an Appletini, or maybe chilled Reisling wine. Oooo, or a champagne cocktail…. 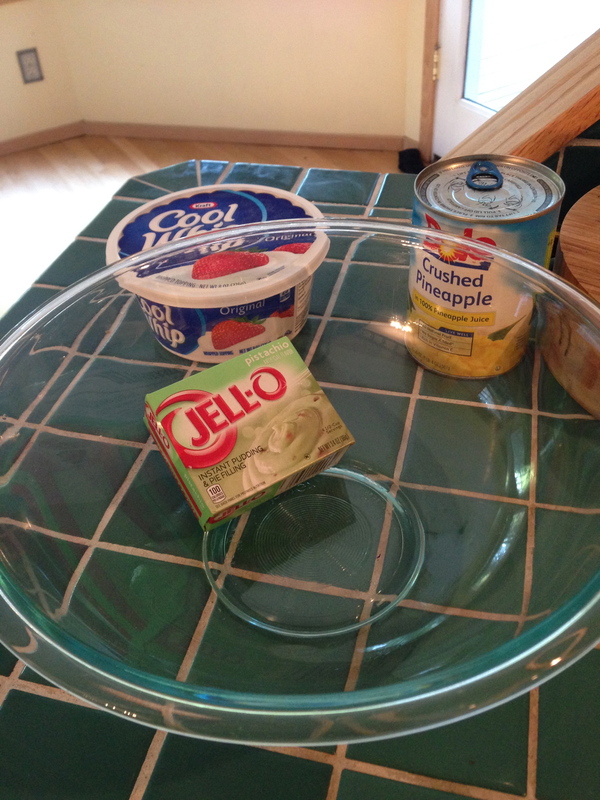 1) Pistachio Jello, a container of Cool Whip and a large can of undrained crushed pineapple. You can also add walnuts…I guess. If you need walnuts in your life. Gently, though. Let’s not be barbarians about this. and enjoy! It was really good, and just what I remember. Pistachio salad is a very unique flavor, but it’s nice. I Know I Am Really Pushing Some Culinary Boundaries By Introducing A Broccoli Recipe. But I Like Living On The Edge. I am honestly not a big broccoli fan. I don’t like steamed broccoli, I don’t like broccoli in soup, I don’t like broccoli baked in stuff. Broccoli has too bold a flavor to hide it in anything, and steaming it just brings out all the bitter flavors I don’t like. You know what I do like? Fresh broccoli. Fresh broccoli is fantastic, and it is a vegetable that stands alone in the kitchen. So, what if you made a broccoli salad from fresh broccoli, and didn’t try to hide the flavors with creams or sauces? What if you simply enhanced how good the flavors are, in a beautiful balance? This broccoli salad is so good, my kids love it. It is so good, I have given it to guests, whom I love. This broccoli salad is so good, my husband likes it. And he isn’t telling me that just because he loves me! 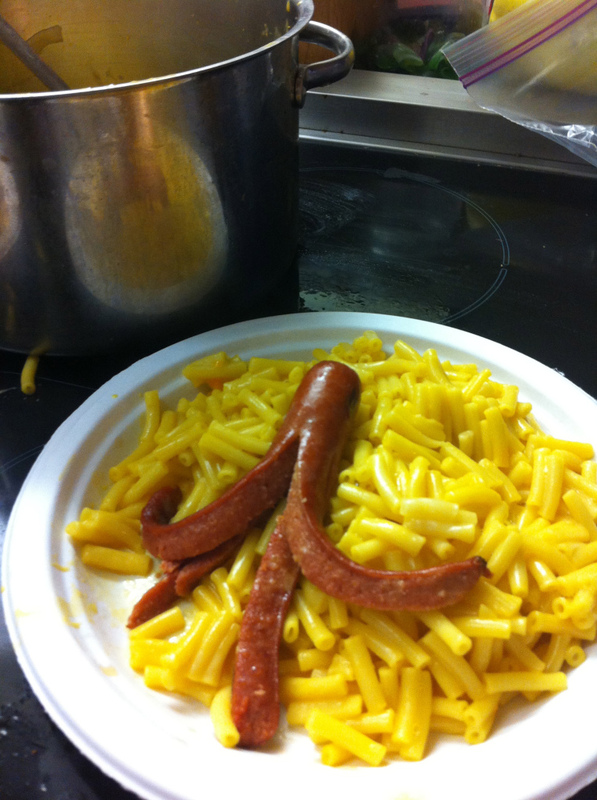 Do not let the incredible simplicity of this dish defy it’s incredible taste. The flavors and textures are a perfect balance of sweet and savory, crunchy and juicy. This isn’t your old-fashioned plate of overly steamed broccoli: this is a dish you could use weekly and not get tired of it. This is also a really easy recipe with zero cooking involved, so you can throw this together as fast as your hands can move. a variable amount of balsamic vinegar…I tend to over do this one. Because I love it. 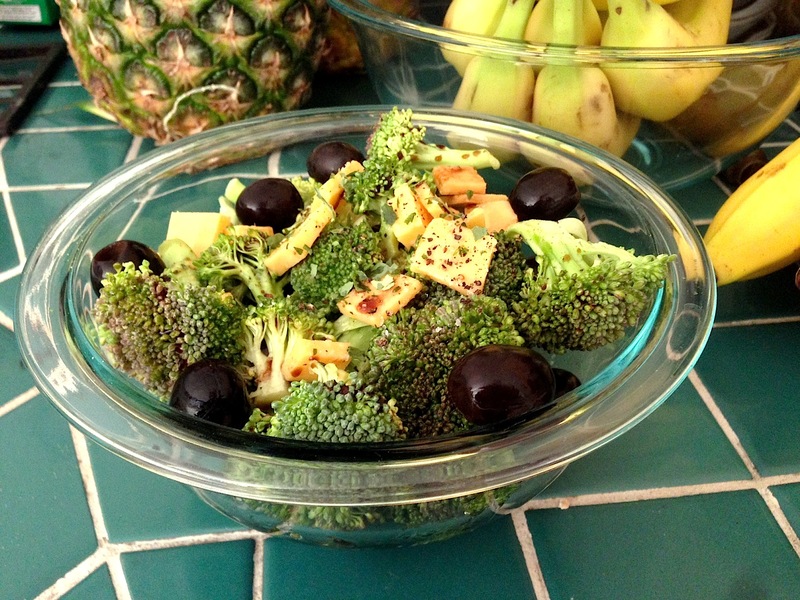 Wash the broccoli florets and put them in a big mixing bowl. Pour the olive oil over the top of it and toss gently. Sprinkle on 3 fat pinches of kosher salt, grind pepper on top and add 1 fat pinch of parsley, then toss. Now add the diced cheddar and olives and toss gently. Then pour about 1/4 cup of balsamic vinegar on top and put it in the fridge to chill a bit. 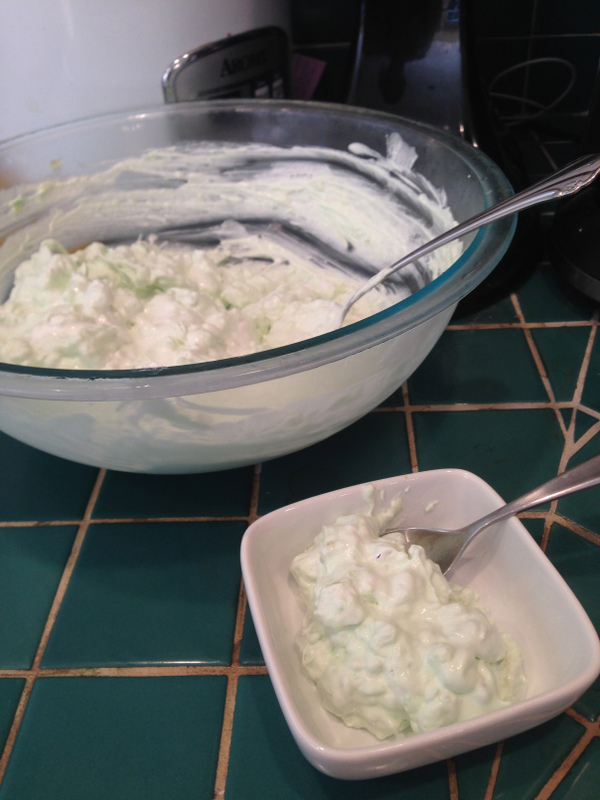 This is a very easy side recipe, and a fantastic compliment for any dish. It is also loaded with great vitamins that can come in super handy during the flu season: 3.5oz of broccoli has 2.82g Protein, Vitamin C 89.2mg (1 orange has 70mg of Vitamin C, for comparison’s sake), Magnesium 21mg, Potassium 316mg. 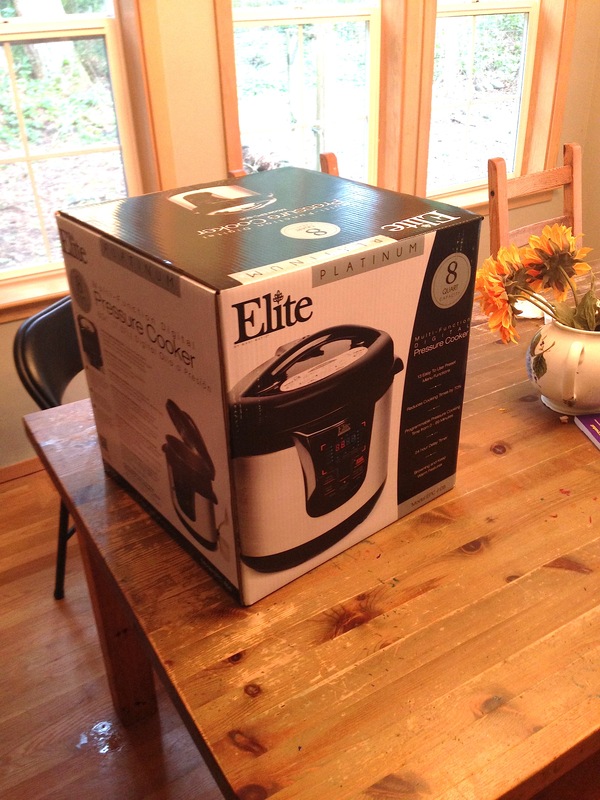 Within this box is my new pressure cooker. My old one was a little old, and I certainly used it until it’s dying breath. The green LED display was half working, and the timer was shoddy. 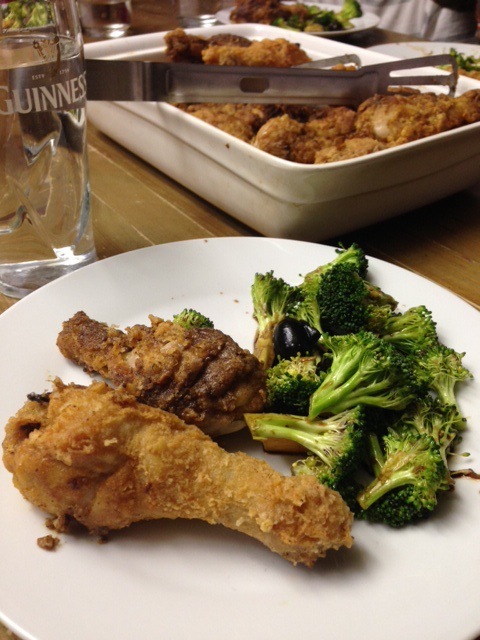 Sometimes it counted down, sometimes it got up to pressure…but there were too many times when I put in a chicken for 25 minutes, and came back to partially cooked chicken. And that just ain’t flying on my kitchen turf. 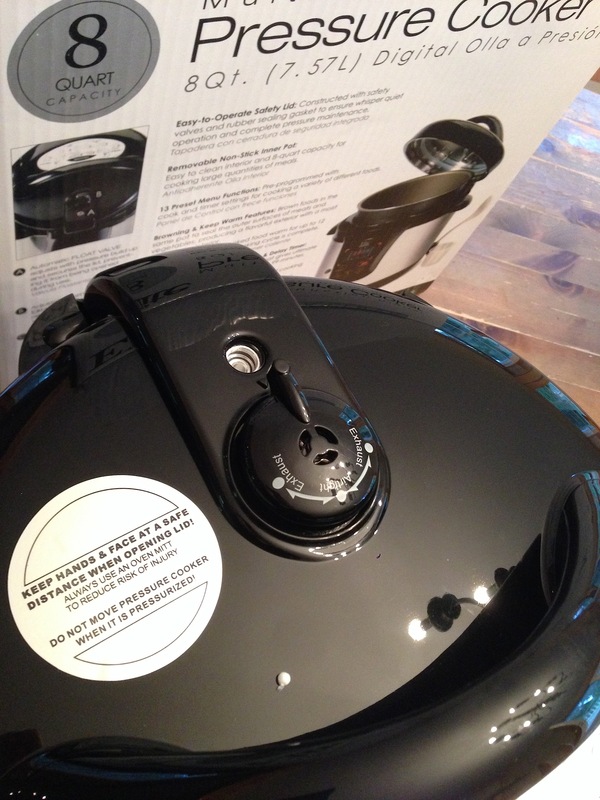 So, one of the things to leave behind was my beloved pressure cooker. I didn’t know what I was going to replace it with, and I wasn’t sure what other models were out there. The last model I had was the cheapest I could find, and it did the job pretty well for the number of years I had it. 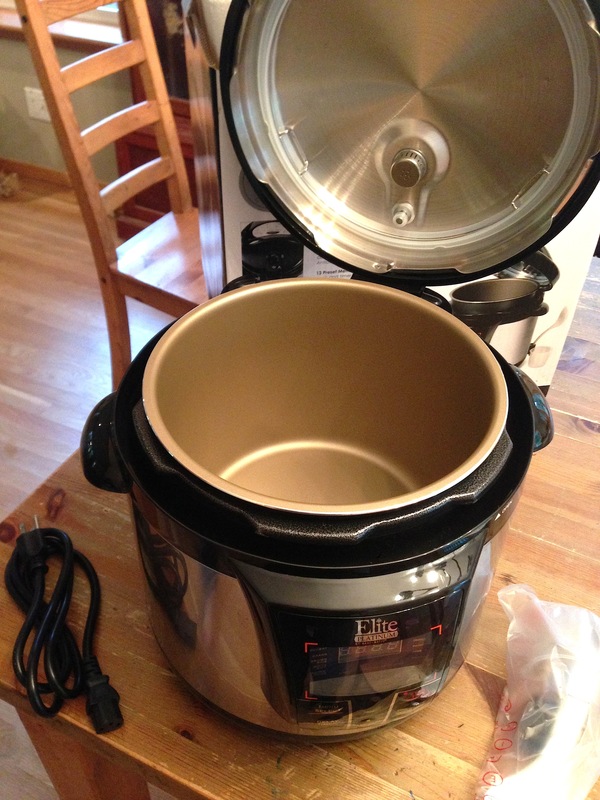 But times have changed, and I have a better understanding of what electric pressure cookers can do now. And, baby: I’m driving a Ferrari this time. 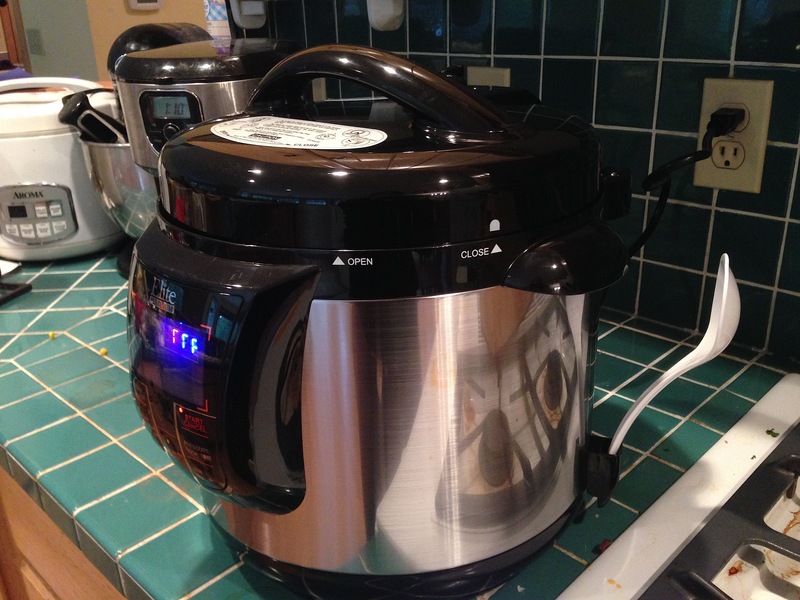 Before we get too far into this, I have a bunch of recipes for electric pressure cookers over at Tamarah.org! Here is one of my favorites, Down Home Chili. 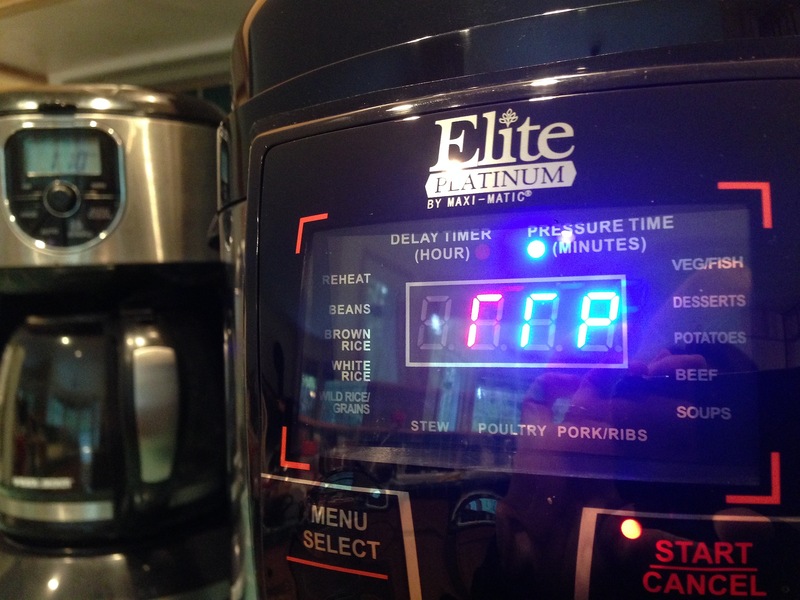 This is the Elite…Platinum…Multi-Function Digital Pressure Cooker. This baby has so many more buttons and features than my last one. The last pressure cooker I had only had “high” and “low” and “time.” This sucker has “hours” and “minutes” and a whole bunch more stuff. Looky! So this is the inside. The pot is removable, which is nice for cleaning. Also dishwasher safe. This is the release valve, which is super swank. The last one I had was just a jiggle top. This one has a whole labeled dial, and it doesn’t look like it will fall apart! Bonus!! This monster is huge. But it has to be, because it is 8 Quarts. The last one I had was 6 quarts, and I could fit a whole chicken in there, if I squished the legs down. This one is HUGE, and I LOVE it. 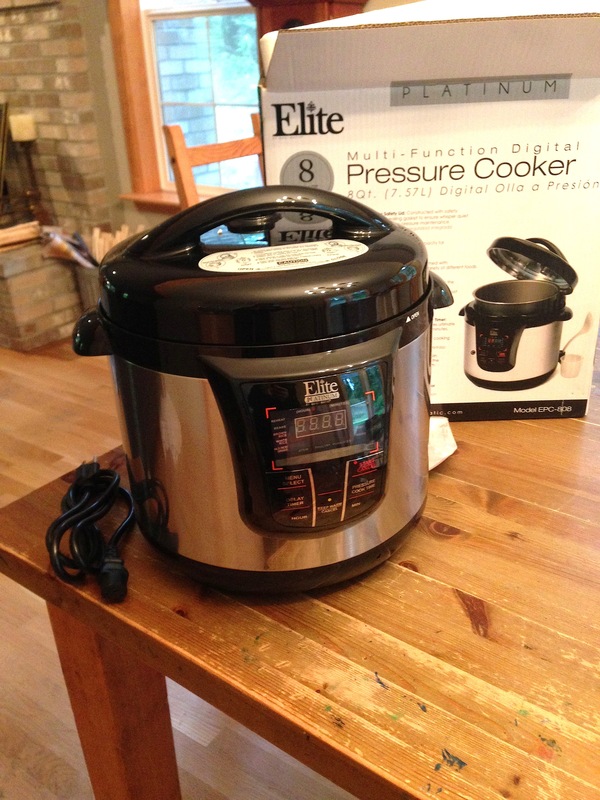 I have been thinking for a while now that I needed to get another pressure cooker, because the one pot was kind of covering a meal for all of us…but the little people are getting bigger and starting to eat more. 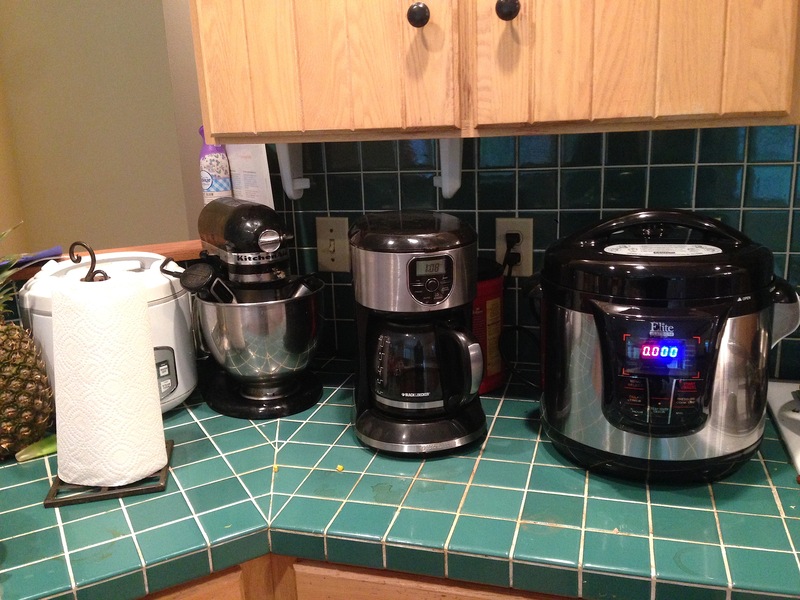 One pressure cooker meal for 7 people was not really cutting it, entirely, anymore. 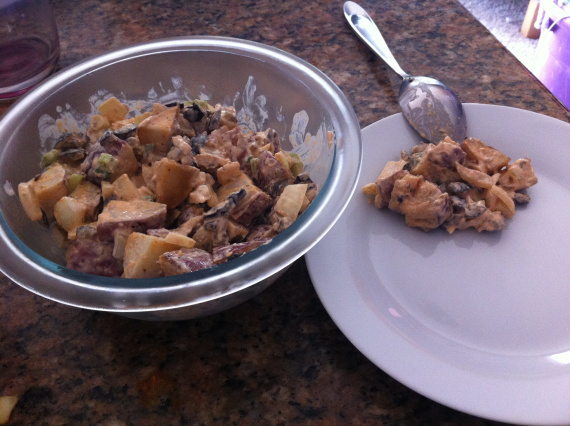 But with this one, I think I can do one meal again! Bigger is definitely better for us. Reheat. Beans. Brown Rice. White Rice. Ancient Grains. Stew. Poultry. Pork/Ribs. Soups. Beef. Potatoes. Desserts. Veg/Fish. It also has a Delay Timer! This is what it looks like when it is closed and warming up. Very quiet, very safe. The outside isn’t warm to the touch, and the lid is locked. This means I don’t have to worry about the kids being around it, or knocking it off or getting hurt. It is now up to pressure and that is when the timer starts! I set it for 10 minutes just to get it going. I was very impressed with how quickly it came to pressure, and how accurate the timer was. Both were spot on. 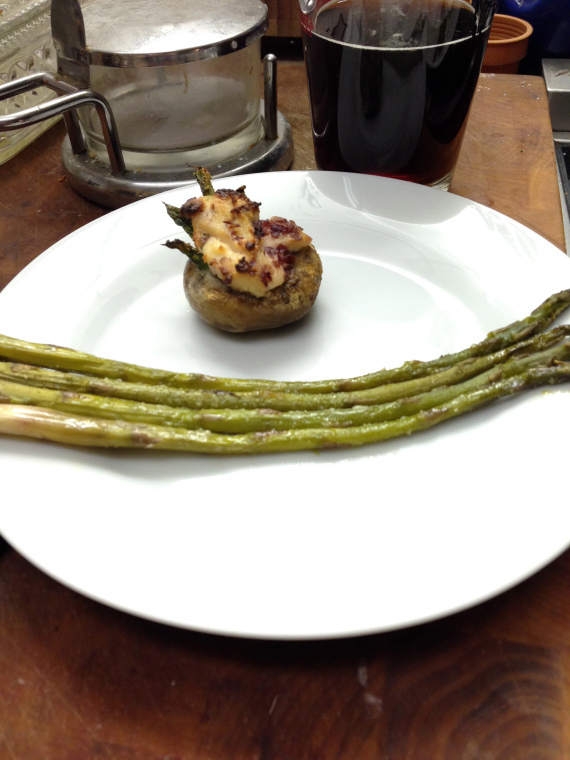 Okay, so after I played around with it enough, I went ahead and made dinner with it. And if you thought I was messing around, then you just don’t know how I work. 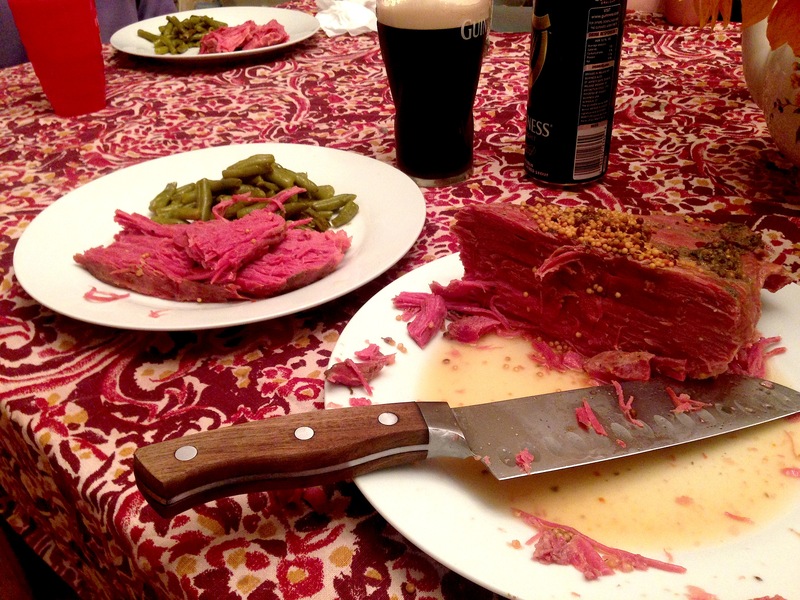 Now, normally Corned Beef takes around 8-9 hours on low for a Crock Pot. 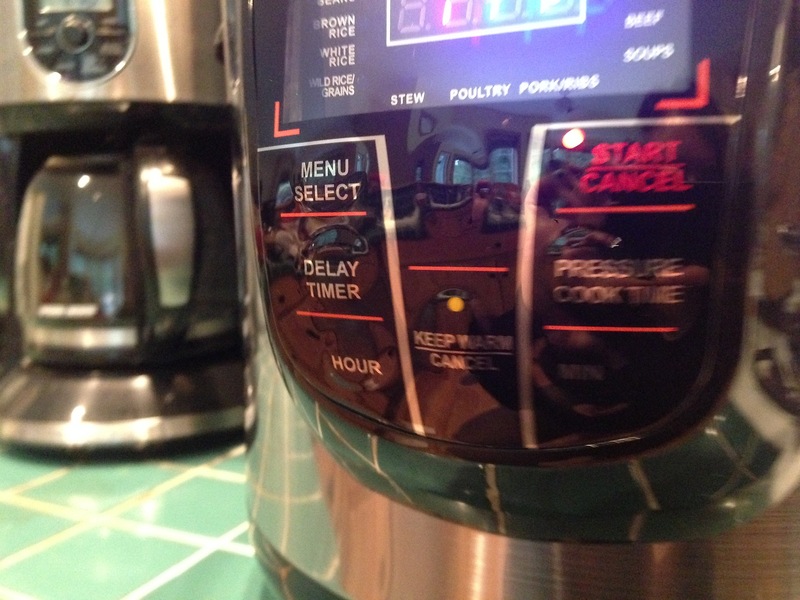 But that isn’t how electric pressure cookers work…we work in minutes, not hours. 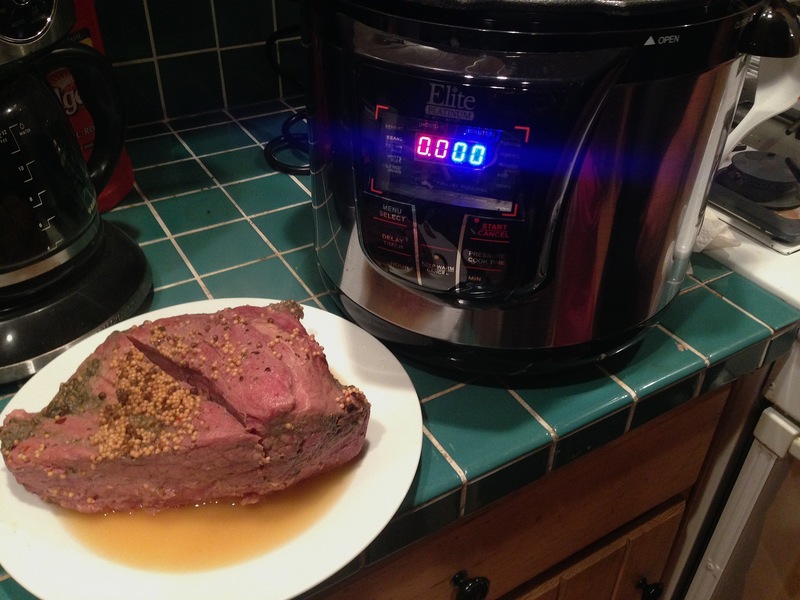 So I put the Corned Beef in, added 6 cups of water and the seasonings, and set the timer for 55 minutes. It came up to pressure very quickly, sealed and cooked for exactly 55 minutes. When it was done, it beeped a few times and I came back to let the pressure release. This lovely dish! Perfectly cooked. Not soggy, not raw, not mushy. Just a perfectly cooked roast of Corned Beef. 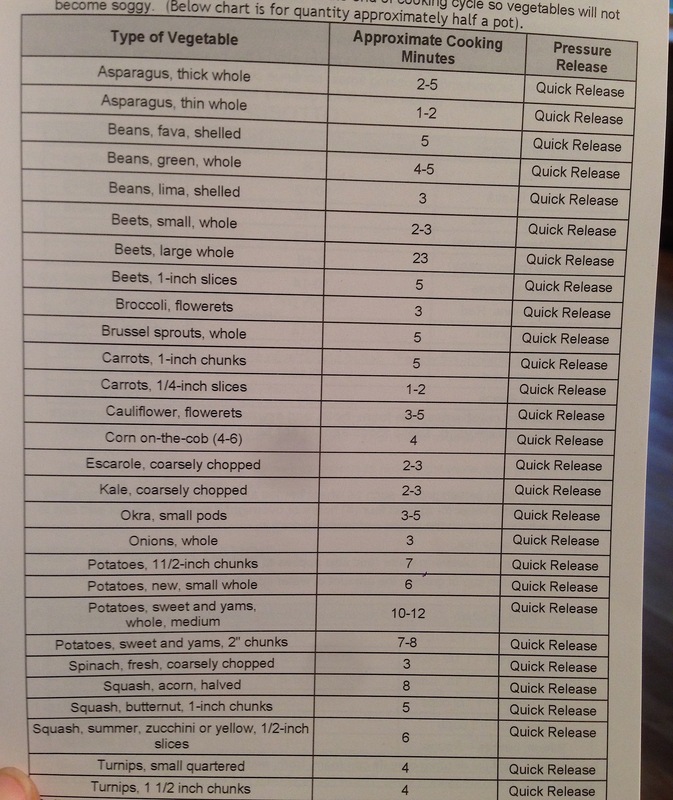 Now, just to finish this off…here are some of the cooking times for different foods. 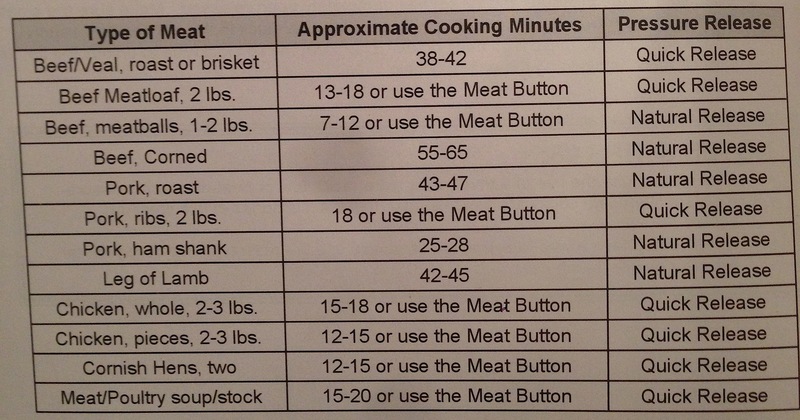 This will give you a better idea of how long it takes to cook meals. Not in hours. In minutes. *I wish I was getting paid for these reviews, but I’m not. I just sincerely believe that good, wholesome food, from scratch, can be an awesome and uncomplicated experience for everybody. Quinoa can definitely be an instrument of torture. If you have had a lump of quinoa served to you at any time, you understand that it can be soggy, mushy, gray, weird, bland and grainy. 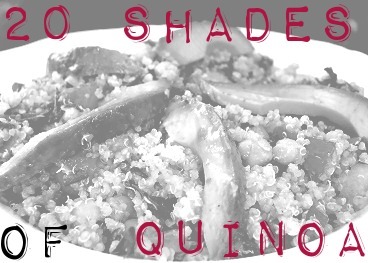 There ain’t nothin’ good about poorly served quinoa. If you insist on treating it like rice, you will have a bad time. So this weekend, surprise your loved ones by blindfolding them, tying them to a chair and serving them actually good dishes of quinoa! “Quinoa (prounounced keen-wa) (link) was a staple food for the South American Indians living in the high altitudes of the Andes Mountains. It was immensely popular because it was one of few crops that could survive in such high altitudes (10,000 – 20,000 feet above sea level). It could withstand frost, intense sun and the often dry conditions that characterized the Andean climate. It was also recognized for its superior nutritional qualities. For these reasons, it was dubbed “mother of all grains” by the Incas, so much so that it came to have spiritual significance for them. Many traditions and ceremonies surrounded the cultivation, harvest and consumption of quinoa. It is like rice, but it isn’t rice. 2 cups water in a medium saucepan. Now that you have quinoa, here are 20 ideas of what to do with quinoa! 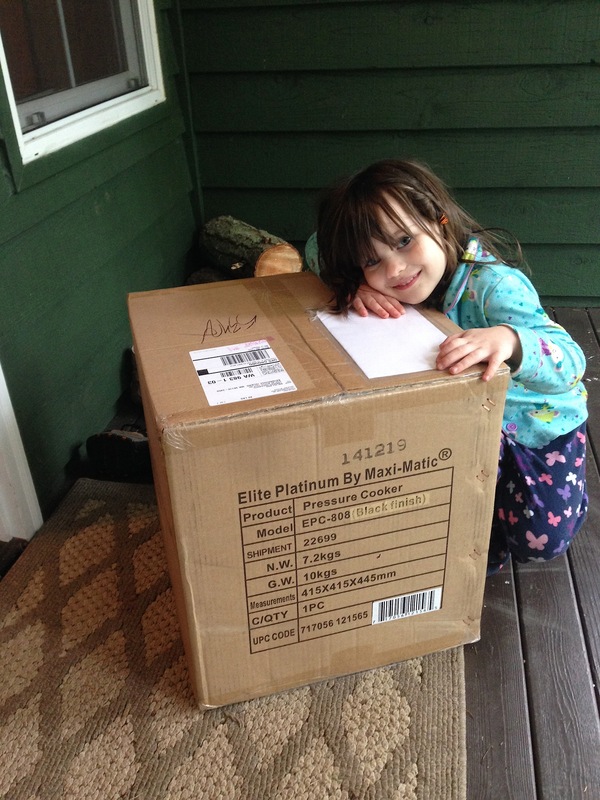 Raising Artists & Creatives: Why are you up there in the first place? Why are you up there in the first place? 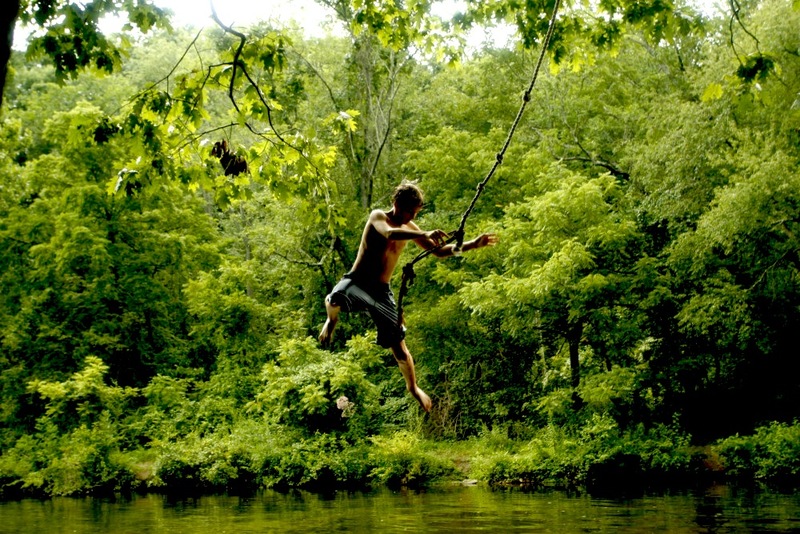 “One day, when I lived near a lake, I was hanging with a group of friends at a swim hole, when we found a freaky rope swing that could get you about 20 feet of air before landing in the water. All of them were enthusiastic to risk it and use it, while I, being the sheepish lady I tend to be, hesitated when it was my turn to go. Anyway, I am sure this is a GREAT idea! And I just found all my notes on it buried in some old file folder on my computer. Show and Tell Time, folks!